The union negotiates funding for training and education in the sheet metal industry. Because of this, union sheet metal workers are the most highly trained and qualified professionals that you can pick to perform your tasks. Price – don’t kid yourself; the non-union contractor knows exactly what the appropriate price for a job is; he just doesn’t pass along a fair share of the profits to his employees. Experience – a lot of people think that owning a pickup and a ladder qualifies them to be a contractor. Not true. Contract union labor workers have levels of training ensuring that you are benefiting from a long tradition of experienced workers. Quality – a union contractor will not walk away from a job until the customer is happy with the results. Training – all union craftsmen and women go through an apprenticeship of 3-5 years. This fact speaks for itself. All have been drug- and background-checked before they go onto the job. Non-credentialed day labor is not your best investment in your project. 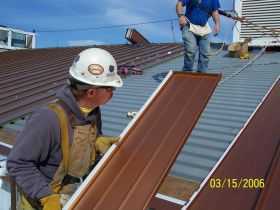 Warranty – a union contractor will return to the project if there is a problem with his work. Try getting someone who you picked out of the yellow pages to do that. Some crafts even have 5 year warranties to guarantee their work. Social responsibility – the saying goes “if you are not part of the solution, you are part of the problem.” Health care, pensions – you know the answer. Even if you only have a little bit of work to be done, hiring a union contractor can make a significant difference in getting another union sister or brother through these hard times.